Unusual and attractive native. Nice clump former but not aggressive. Can be divided after flowering. Prairie Smoke is also known as Grandpa's Whiskers. Both names refer to the lovely seed heads of soft feathery plumes. These follow the rose - colored blooms of early to mid spring. This is a native prairie species that fares well in relatively dry soil and a sunny location. 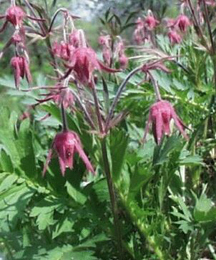 Prairie Smoke is a short plant reaching only 6 to 12 inches. It forms clumps slowly but should be divided every third year or so to maintain vigor - this is best done after flowering. It can be placed in the front of wildflower gardens or borders. It also makes a nice complement to spring bulbs. Space new plants about a foot apart.